Product #21488 | SKU CD-ODYSSEY7Q+ | 0.0 (no ratings yet) Thanks for your rating! Convergent Design's Odyssey7Q+ is a monitor/recorder that provides all of the features and functionality of the Odyssey7Q but adds support for 4K recording over HDMI. It features a 7.7"(19.5 cm), 1280 x 800, OLED, touchscreen display with a 3400:1 contrast ratio, true blacks, and professional monitoring features such as waveform, histogram, vectorscope, anamorphic de-squeeze, and 3D LUT support. Out-of-the-box, the Odyssey7Q+ can record up to DCI 4K (4096 x 2160) and Ultra HD (3840 x 2160) in the compressed Apple ProRes 422 HQ format or up to 2K/1080p using the uncompressed DPX file format. The Titan Extract option, which allows you to create multiple HD windows from a single 4K source, is included. Additionally, it supports several RAW recording options for ARRI, Canon, Sony, and POV cameras, which are available for purchase or rental from Convergent Design's website. 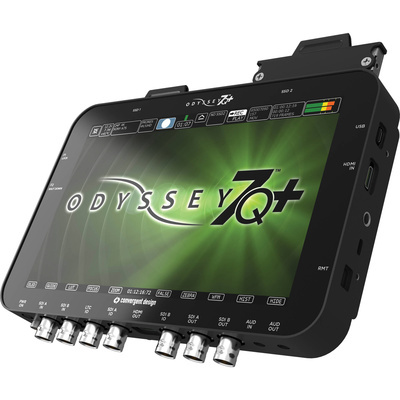 The Odyssey7Q+ has two 3G-SDI inputs (6G-SDI compatibility requires firmware v2016.01), two 3G-SDI outputs, and two bi-directional 3G-SDI connectors which can be assigned as either inputs or outputs via menu selection. It also has a 4K-capable HDMI input and an HDMI output that supports up to 1080p30 4:2:2. Most of the inputs/outputs are on the bottom of the monitor, with 1/4"-20 mounting threads on the sides. Dual SSD slots are provided for recording video to Convergent Design Premium 2.5" SSDs, which offer high speeds, reliability, and power-loss protection. Select Samsung SSDs are also supported for more cost-effective recording media. An AC adapter is included for powering the device, with optional battery plates available. Also included is a 36" Micro HDMI to HDMI cable and a HDMI to Mini HDMI adapter, useful for using the Odyssey7Q+ with DSLRs and mirrorless cameras with Micro HDMI outputs. The Titan HD Extract option allows you to take one camera to a shoot and obtain three separate recordings (plus a live switch between the three images). This feature can add a multi-cam look to single-camera shoots without the expense of multiple cameras or recorders. One view is an HD downscale/super-sample of the full image area, and two views are windows selected from the full image area. These views can be panned smoothly through the 4K field, and the three views can be Live-Switched. All four HD views (The master/wide, the two windowed views, and the live-swtiched/programme) can be recorded simultaneously in Apple ProRes with matching timecode and file names. SDI inputs now support 6G-SDI in addition to 3G-SDI. 4K@60 can be recorded to Apple ProRes 422. The Odyssey now supports 4K@30 from Blackmagic Design cameras. 7.7" 1280x800 OLED touchscreen panel featuring true blacks and accurate colour with a full range colour gamut for REC709 or DCI-P3 viewing. The Odyssey7Q+ features two dedicated 3G-SDI inputs, two dedicated 3G-SDI outputs, two switchable 3G-SDI input/outputs, one HDMI input, one HDMI output (up to 1080p 30fps). Active Cross-Conversion means that all outputs are always active regardless of which input is used. Up to four HD video signals can be input and viewed simultaneously (quad-split) or live-switched (choose between inputs for full screen display). A future paid update will allow Multi-Stream Recording of up to four simultaneous Apple ProRes 422 (HQ) files and an XML log file of the live switch. 2.0x, 1.5x, 1.33x de-squeeze options for monitoring anamorphic footage. Adjusted image sent to video outputs; recording unaffected. Centre Extraction mode de-squeezes and magnifies centre portion of image for common anamorphic formats. Adjusted image sent to video output; recording unaffected. Note: All LUTs listed are in the industry-standard .cube format and are available with firmware v2015.7 or later. They must be loaded through the CD 3D-LUT Convertor App and then loaded onto an Odyssey SSD or Odyssey Utility Drive in order to then be loaded into the Odyssey7Q+. Additional LUTs can be downloaded from Convergent Design's website. Record 4K (4096x2160), UHD (3840x2160), 2K (2048x1080) and HD (1920x1080, 1280x720) Video in Apple ProRes 422 (HQ) over SDI. The Odyssey7Q+ can record 4K/UHD 10-bit or 1080p60 10-bit over HDMI. Record 2K (2048x1080) and HD (1920x1080) Video in 12-bit or 10-bit uncompressed DPX files. An HDMI-based 4K (4096x2160) or UHD (3840x2160) video signal can be supersampled in real time in the Odyssey7Q+ to a 2K (2048x1080) or HD (1920x1080) video signal and recorded in Apple ProRes (HQ, 422, or LT). The resulting images out-resolve the 2K/HD image that many smaller cameras can produce internally. Another advantage is if the camera is limited to 8-bit output, the Odyssey7Q+ supersampling will result in a pseudo-10-bit colour sampling for improved colour reproduction. To enable recording on the Odyssey, Convergent Design Premium SSDs (Odyssey SSDs) or third party SSDs qualified by Convergent Design must be used. Note: Samsung SSDs draw more power than Odyssey SSDs. Convergent Design recommends using an AC-powered USB3 adapter or a Thunderbolt adapter when connecting Samsung SSDs to a computer. Convergent Design monitors/recorders are designed and built in the United States and each model is thoroughly test before they are shipped. They go through a lengthy burn-in, where they are heat cycled while operating, and then endure another lengthy period where they are repeatedly turned on and off. They are also drop tested, then individually tested, all in Convergent Design's factory in Colourado Springs, Colourado, USA.